This guest post comes from Endeca, a Brightcove Technology Partner. Endeca is a search and business intelligence software company that improves daily decisions for employees and purchase decisions for customers. Endeca and Brightcove have collaborated to develop an integrated solution which brings together Endeca’s industry leading search, navigation and merchandising capabilities with the Brightcove Video Platform. All of our customers – across retail, media, brand manufacturing, or financial services – are rapidly growing their video libraries. And they’re finding that it’s great for business. Online video – especially for product-centric businesses – closes the gap between the “touch and feel” experience of being in a physical store. And it is exceptionally well suited for product demonstrations. This is because video has the power to influence these metrics more than any other type of online content because it provides detail-hungry shoppers with a unique 360° product view and requires a higher level of customer engagement. But it’s not just about getting more video on your site. It’s also about making sure customers see the right video at just the right time on their journey. We advise customers who are new digital media that as they create and store the new assets to make certain that they have rich metadata surrounding the source content. It seems like a lot of work up front to either manually tag each video or use text analytics technology to draw out more metadata, but it pays off for the customer experience. Why? Because when watching TV or a movie, viewers tend to be fairly relaxed. The online video experience in much different. The viewer is more time-constrained, goal-oriented with hand-on-mouse, ready to click away if not instantly shown what is relevant to them in that moment. And therein lies the challenge: presenting just the right video content in the context of a customer’s path. So with the right metadata around each video, you can showcase just the right one no matter where the customer is in their experience. On the way to making their final transaction, your customers will spend up to two-thirds of their time searching and browsing through various products. Don’t neglect the opportunity to showcase related videos along that path. This becomes more challenging to do as customers get deeper into the site and combine many product attributes to explore their options. You will have to find ways to automatically associate the content in your video library to specific search terms and combinations of product attributes. Here are some two really great examples of businesses leverage video in great ways. 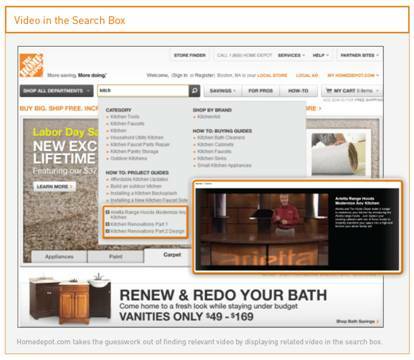 Homedepot.com takes the guesswork out of finding videos related to a shopper’s intent by highlighting “how-to” videos from most shoppers first interaction with the site – the search box. Advanced search type-ahead on the Home Depot Web site highlights related video content for a search for “kitchen.” Without much hunting, visitors can immediately go directly to “how-to” videos related to their search. Without knowing much about the shoppers intent when they arrive, within a few keystrokes this technique can put the visitor on the path to learning more. Because Homedepot.com has the right around their video content, they immediately increase the relevancy of the search results and the likelihood of a customer discovering new information and products. Another great example is the The Food Network. They keep visitors engaged on their site with video content no matter what unpredictable path a customer might take. For example, a search for “chocolate” displays all chocolate-related content, while a more specific combination of “chocolate” and “cake” only features videos about “chocolate cakes.” As the visitor refines her search more, only the most relevant video content appears. The video types exposed in the search and browse pages range from expert advice from Bobby Flay to “how-to” videos on choosing the optimal cake pan. You could take this concept a step further by making “video type” a facet in the left hand navigation, allowing visitors to refine specifically on the kind of message they’re interested in hearing at that moment. In this case the strategy is to reveal all related video content in one place and automatically refine the presentation as the customer gives you more clues about what they might be looking for. As you grow your retail video library, don’t forget to keep the audience and content top of mind. Having a large assembly of video is of course important. But making sure your customers see the right message at just the right time is even more valuable for growing revenue and reducing returns. As you develop and store your videos, make certain that they have the right metadata surrounding the source content with either manually tagging or using text analytics technology to draw out more metadata. By keeping audience and context in mind, you will likely find many opportunities to use video content to grow your online business in dramatic ways. For more ideas on how to incorporate video into the online customer experience, download this whitepaper or visit the Endeca eBusinessFacets blog. 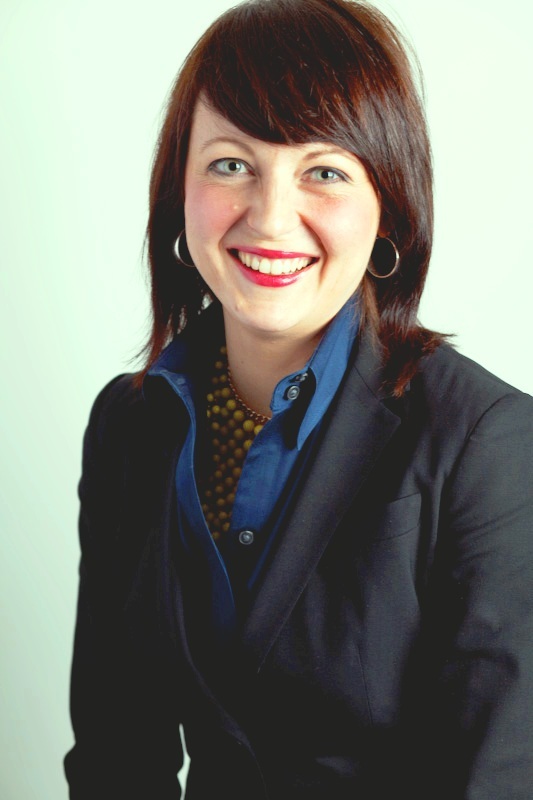 About the author: Katrina Gosek is Product Marketing Lead for eBusiness at Endeca Technologies, a leader in innovative customer experience applications used by 44 of the Top 100 Online Retailers and leading online media companies. She is responsible for marketing Endeca's B2B, Media, Site Search and SEO solutions to these eBusiness clients, which includes sharing online marketing best practice strategies and trend. She also works with clients to help outline and analyze Endeca's impact on their business pre- and post- implementation. Prior to Endeca, Katrina spent her early career in the media and publishing industry where she managed online marketing strategy for both new media and traditional products. Katrina holds a BA from Vanderbilt University, an MA in French Literature from Harvard University, and MBA from Babson College. She tweets at @Endeca_eBiz.